Stuart Dallas scored the winner as Brentford secured their first Championship win of the season and left Blackpool bottom without a point. Nathan Delfouneso gave the home side an early lead when he headed home Francois Zoko's left-wing cross. But Alex Pritchard levelled for the Bees when he met Moses Odubajo's lay-off and fired home from 25 yards. And Dallas settled it when he stole the ball off Donervon Daniels near the by-line and cut inside to fire home. Brentford almost added a third when their substitute Jota slid the ball across the six-yard area from the right, but it just evaded the onrushing Pritchard. Blackpool did not go down without a fight, staging a late rally after bringing former Newcastle striker Nile Ranger off the bench with 15 minutes to go. Ranger set up a golden chance for Sergei Zenjov to equalise six minutes from time, but Bees keeper David Button denied him from six yards. Delfouneso also went close in the closing stages, firing over the bar, but Brentford held out to take all three points. Defeat leaves Blackpool with just one win from their last 13 games in all competitions. After losing 27 players this summer and signing 17, the Seasiders do not have a point to show for their three league matches so far this season. The crowd of 9,939 was well down on their average of 14,216 at Bloomfield Road last season. Blackpool manager Jose Riga: "I am frustrated because we were leading. We were good in the game. "The fact is that we don't have two players in the same level. It's a completely new team. If we were able from day one to work together we could get the results, but it is not the situation. Every time we are close." Brentford manager Mark Warburton: "We didn't know what to expect from Blackpool. Our analysis department work very hard on preparing the players and letting them know what to expect. "We looked at the first couple of weeks and we thought we were maybe lacking a little bit of self belief. Can we make an impact at this level? We're not here to make up the numbers. "The performance on Saturday was excellent and that gave them a belief. It's important to get three points." Match ends, Blackpool 1, Brentford 2. 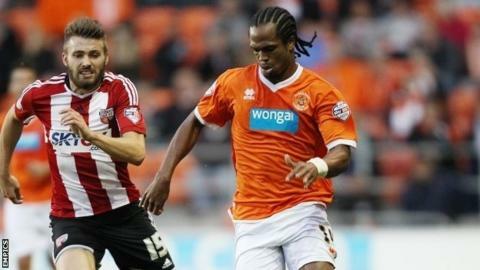 Second Half ends, Blackpool 1, Brentford 2. Corner, Blackpool. Conceded by Jake Bidwell. Corner, Brentford. Conceded by Edu Oriol. Attempt missed. Nathan Delfouneso (Blackpool) right footed shot from outside the box is high and wide to the right. Assisted by Peter Clarke. Foul by Edu Oriol (Blackpool). Alex Pritchard (Brentford) wins a free kick on the right wing. Alan McCormack (Brentford) wins a free kick on the right wing. Foul by David Perkins (Blackpool). Alan Judge (Brentford) wins a free kick in the defensive half. Edu Oriol (Blackpool) wins a free kick in the attacking half. Foul by Alan McCormack (Brentford). Attempt missed. Alan Judge (Brentford) right footed shot from outside the box is high and wide to the right. Assisted by Alex Pritchard. Attempt blocked. John Lundstram (Blackpool) right footed shot from outside the box is blocked. Attempt blocked. Sergei Zenjov (Blackpool) right footed shot from the right side of the box is blocked. Donervon Daniels (Blackpool) wins a free kick in the defensive half. Corner, Blackpool. Conceded by Alan McCormack. Substitution, Blackpool. Sergei Zenjov replaces Francois Zoko. Attempt saved. Edu Oriol (Blackpool) right footed shot from outside the box is saved in the centre of the goal. Attempt missed. Jota (Brentford) left footed shot from outside the box is too high. Assisted by Alex Pritchard. John Lundstram (Blackpool) wins a free kick in the attacking half. Foul by Nile Ranger (Blackpool). James Tarkowski (Brentford) wins a free kick in the defensive half. Substitution, Blackpool. Nile Ranger replaces Ishmael Miller. Attempt missed. John Lundstram (Blackpool) right footed shot from outside the box is high and wide to the right. Assisted by Edu Oriol. Attempt blocked. Ishmael Miller (Blackpool) right footed shot from outside the box is blocked. Assisted by Edu Oriol. Foul by James Tarkowski (Brentford). Donervon Daniels (Blackpool) wins a free kick in the attacking half. Substitution, Brentford. Tommy Smith replaces Nick Proschwitz. Substitution, Brentford. Jota replaces Moses Odubajo. Attempt saved. Tony McMahon (Blackpool) left footed shot from the right side of the box is saved in the top left corner. Assisted by David Perkins with a through ball. Attempt missed. David Perkins (Blackpool) left footed shot from outside the box is high and wide to the left. Substitution, Blackpool. Edu Oriol replaces Tomasz Cywka. Moses Odubajo (Brentford) wins a free kick on the right wing. Foul by Joan Oriol (Blackpool). Goal! Blackpool 1, Brentford 2. Stuart Dallas (Brentford) right footed shot from the left side of the box to the high centre of the goal. Assisted by Tony Craig. Jonathan Douglas (Brentford) wins a free kick in the defensive half.